Communism includes a variety of schools of thought, which broadly include Marxism and anarchism (anarcho-communism), as well as the political ideologies grouped around both. All of these share the analysis that the current order of society stems from its economic system, capitalism; that in this system there are two major social classes; that conflict between these two classes is the root of all problems in society; and that this situation will ultimately be resolved through a social revolution. The two classes are the working class—who must work to survive and who make up the majority within society—and the capitalist class—a minority who derives profit from employing the working class through private ownership of the means of production. The revolution will put the working class in power and in turn establish social ownership of the means of production, which according to this analysis is the primary element in the transformation of society towards communism. Critics of communism can be roughly divided into those concerning themselves with the practical aspects of 20th century communist states and those concerning themselves with communist principles and theory. The term "communism" was first coined and defined in its modern definition by the French philosopher and writer Victor d'Hupay. In his 1777 book Projet de communauté philosophe (Project for a Philosophical Community), d'Hupay pushes the philosophy of the Enlightenment to principles which he lived up to during most of his life in his bastide of Fuveau (Provence). This book can be seen as the cornerstone of communist philosophy as d'Hupay defines this lifestyle as a "commune" and advises to "share all economic and material products between inhabitants of the commune, so that all may benefit from everybody's work". According to Richard Pipes, the idea of a classless, egalitarian society first emerged in Ancient Greece. The 5th-century Mazdak movement in Persia (Iran) has been described as "communistic" for challenging the enormous privileges of the noble classes and the clergy, for criticizing the institution of private property and for striving to create an egalitarian society. At one time or another, various small communist communities existed, generally under the inspiration of Scripture. For example, in the medieval Christian Church some monastic communities and religious orders shared their land and their other property (see religious and Christian communism). Communist thought has also been traced back to the works of the 16th-century English writer Thomas More. In his treatise Utopia (1516), More portrayed a society based on common ownership of property, whose rulers administered it through the application of reason. In the 17th century, communist thought surfaced again in England, where a Puritan religious group known as the "Diggers" advocated the abolition of private ownership of land. In his 1895 Cromwell and Communism, Eduard Bernstein argued that several groups during the English Civil War (especially the Diggers) espoused clear communistic, agrarian ideals and that Oliver Cromwell's attitude towards these groups was at best ambivalent and often hostile. Criticism of the idea of private property continued into the Age of Enlightenment of the 18th century through such thinkers as Jean Jacques Rousseau in France. Later, following the upheaval of the French Revolution communism emerged as a political doctrine. In the early 19th century, various social reformers founded communities based on common ownership. However, unlike many previous communist communities they replaced the religious emphasis with a rational and philanthropic basis. Notable among them were Robert Owen, who founded New Harmony in Indiana (1825), as well as Charles Fourier, whose followers organized other settlements in the United States such as Brook Farm (1841–1847). In its modern form, communism grew out of the socialist movement in 19th-century Europe. As the Industrial Revolution advanced, socialist critics blamed capitalism for the misery of the proletariat—a new class of urban factory workers who labored under often-hazardous conditions. Foremost among these critics were Karl Marx and his associate Friedrich Engels. In 1848, Marx and Engels offered a new definition of communism and popularized the term in their famous pamphlet The Communist Manifesto. The 1917 October Revolution in Russia set the conditions for the rise to state power of Vladimir Lenin's Bolsheviks, which was the first time any avowedly communist party reached that position. The revolution transferred power to the All-Russian Congress of Soviets, in which the Bolsheviks had a majority. The event generated a great deal of practical and theoretical debate within the Marxist movement. Marx predicted that socialism and communism would be built upon foundations laid by the most advanced capitalist development. However, Russia was one of the poorest countries in Europe with an enormous, largely illiterate peasantry and a minority of industrial workers. Marx had explicitly stated that Russia might be able to skip the stage of bourgeois rule. The moderate Mensheviks (minority) opposed Lenin's Bolshevik (majority) plan for socialist revolution before capitalism was more fully developed. The Bolsheviks' successful rise to power was based upon the slogans such as "Peace, bread and land" which tapped into the massive public desire for an end to Russian involvement in the First World War, the peasants' demand for land reform, and popular support for the soviets. The Soviet Union was established in 1922. Following Lenin's democratic centralism, the Leninist parties were organized on a hierarchical basis, with active cells of members as the broad base. They were made up only of elite cadres approved by higher members of the party as being reliable and completely subject to party discipline. In the Moscow Trials, many old Bolsheviks who had played prominent roles during the Russian Revolution of 1917 or in Lenin's Soviet government afterwards, including Kamenev, Zinoviev, Rykov and Bukharin, were accused, pleaded guilty of conspiracy against the Soviet Union, and were executed. Its leading role in the Second World War saw the emergence of the Soviet Union as a superpower, with strong influence over Eastern Europe and parts of Asia. The European and Japanese empires were shattered and communist parties played a leading role in many independence movements. Marxist–Leninist governments modeled on the Soviet Union took power with Soviet assistance in Bulgaria, Czechoslovakia, East Germany, Poland, Hungary and Romania. A Marxist–Leninist government was also created under Marshal Tito in Yugoslavia, but Tito's independent policies led to the expulsion of Yugoslavia from the Cominform which had replaced the Comintern and Titoism was branded "deviationist". Albania also became an independent Marxist–Leninist state after World War II. Communism was seen as a rival of and a threat to western capitalism for most of the 20th century. The Soviet Union was dissolved on December 26, 1991. It was a result of the declaration number 142-Н of the Soviet of the Republics of the Supreme Soviet of the Soviet Union. The declaration acknowledged the independence of the former Soviet republics and created the Commonwealth of Independent States, although five of the signatories ratified it much later or did not do it at all. On the previous day, Soviet President Mikhail Gorbachev (the eighth and final leader of the Soviet Union) resigned, declared his office extinct and handed over its powers – including control of the Soviet nuclear missile launching codes – to Russian President Boris Yeltsin. That evening at 7:32, the Soviet flag was lowered from the Kremlin for the last time and replaced with the pre-revolutionary Russian flag. Previously, from August to December all the individual republics, including Russia itself, had seceded from the union. The week before the union's formal dissolution, eleven republics signed the Alma-Ata Protocol formally establishing the Commonwealth of Independent States and declaring that the Soviet Union had ceased to exist. At present, states controlled by Marxist–Leninist parties under a single-party system include the People's Republic of China, Cuba, Laos, and Vietnam. 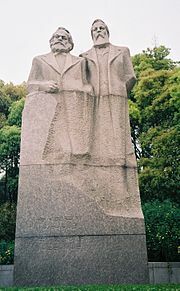 North Korea currently refers to its leading ideology as Juche, which is portrayed as a development of Marxism–Leninism. Communist parties, or their descendant parties, remain politically important in a number of other countries. The South African Communist Party is a partner in the African National Congress-led government. In India, as of March 2018[update], communists lead the government of only one state, Kerala. In Nepal, communists hold a majority in the parliament. The Communist Party of Brazil was a part of the parliamentary coalition led by the ruling democratic socialist Workers' Party until August 2016. The People's Republic of China has reassessed many aspects of the Maoist legacy and along with Laos, Vietnam and to a lesser degree Cuba has decentralized state control of the economy in order to stimulate growth. Chinese economic reforms were started in 1978 under the leadership of Deng Xiaoping and since then China has managed to bring down the poverty rate from 53% in the Mao era to just 6% in 2001. These reforms are sometimes described by outside commentators as a regression to capitalism, but the communist parties describe it as a necessary adjustment to existing realities in the post-Soviet world in order to maximize industrial productive capacity. In these countries, the land is a universal public monopoly administered by the state, as are natural resources and vital industries and services. The public sector is the dominant sector in these economies and the state plays a central role in coordinating economic development. 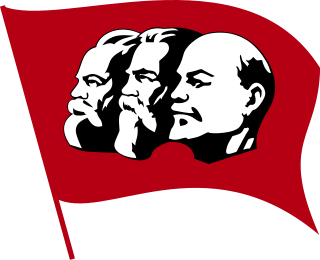 Marxism, first developed by Karl Marx and Friedrich Engels in the mid-1800s, has been the foremost ideology of the communist movement. Marxism considers itself to be the embodiment of scientific socialism, and rather than model an "ideal society" based on intellectuals' design, it is a non-idealist attempt at the understanding of society and history through an analysis based in real life. Marxism does not see communism as a "state of affairs" to be established, but rather as the expression of a real movement, with parameters which are derived completely from real life and not based on any intelligent design. Therefore, Marxism does no blueprinting of a communist society and it only makes an analysis which concludes what will trigger its implementation and discovers its fundamental characteristics based on the derivation of real life conditions. At the root of Marxism is the materialist conception of history, known as historical materialism for short. It holds that the key characteristic of economic systems through history has been the mode of production and that the change between modes of production has been triggered by class struggle. According to this analysis, the Industrial Revolution ushered the world into a new mode of production: capitalism. Before capitalism, certain working classes had ownership of instruments utilized in production, but because machinery was much more efficient this property became worthless and the mass majority of workers could only survive by selling their labor, working through making use of someone else's machinery and therefore making someone else profit. Thus with capitalism the world was divided between two major classes: the proletariat and the bourgeoisie. These classes are directly antagonistic: the bourgeoisie has private ownership of the means of production and earns a profit off surplus value, which is generated by the proletariat, which has no ownership of the means of production and therefore no option but to sell its labor to the bourgeoisie. Historical materialism goes on and says: the rising bourgeoisie within feudalism, through the furtherance of its own material interests, captured power and abolished, of all relations of private property, only the feudal privileges and with this took out of existence the feudal ruling class. This was another of the keys behind the consolidation of capitalism as the new mode of production, which is the final expression of class and property relations and also has led into a massive expansion of production. It is therefore only in capitalism that private property in itself can be abolished. Similarly, the proletariat will capture political power, abolish bourgeois property through the common ownership of the means of production, therefore abolishing the bourgeoisie and ultimately abolishing the proletariat itself and ushering the world into a new mode of production: communism. In between capitalism and communism there is the dictatorship of the proletariat, a democratic state where the whole of the public authority is elected and recallable under the basis of universal suffrage. It is the defeat of the bourgeois state, but not yet of the capitalist mode of production and at the same time the only element which places into the realm of possibility moving on from this mode of production. An important concept in Marxism is socialization vs. nationalization. Nationalization is merely state ownership of property, whereas socialization is actual control and management of property by society. Marxism considers socialization its goal and considers nationalization a tactical issue, with state ownership still being in the realm of the capitalist mode of production; in the words of Engels: "[The transformation [...] into State-ownership does not do away with the capitalistic nature of the productive forces. [...] State-ownership of the productive forces is not the solution of the conflict, but concealed within it are the technical conditions that form the elements of that solution". This has led some Marxist groups and tendencies to label states such as the Soviet Union—based on nationalization—as state capitalist. Marxism–Leninism is a political ideology developed by Joseph Stalin, which according to its proponents is based in Marxism and Leninism. 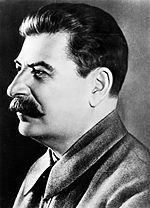 The term describes the specific political ideology which Stalin implemented in the Communist Party of the Soviet Union and in a global scale in the Comintern. There is no definite agreement between historians of about whether Stalin actually followed the principles of Marx and Lenin. It also contains aspects which according to some are deviations from Marxism, such as "socialism in one country". Marxism–Leninism was the ideology of the most clearly visible communist movement. As such, it is the most prominent ideology associated with communism. Marxism–Leninism refers to the socioeconomic system and political ideology implemented by Stalin in the Soviet Union and later copied by other states based on the Soviet model (central planning, one-party state and so on), whereas Stalinism refers to Stalin's style of governance. Marxism–Leninism stayed after de-Stalinization, Stalinism did not. In the last letters before his death, Lenin in fact warned against the danger of Stalin's personality and urged the Soviet government to replace him. Marxism–Leninism has been criticized by other communist and Marxist tendencies. They argue that Marxist–Leninist states did not establish socialism, but rather state capitalism. According to Marxism, the dictatorship of the proletariat represents the rule of the majority (democracy) rather than of one party, to the extent that co-founder of Marxism Friedrich Engels described its "specific form" as the democratic republic. Additionally, according to Engels state property by itself is private property of capitalist nature unless the proletariat has control of political power, in which case it forms public property. Whether the proletariat was actually in control of the Marxist–Leninist states is a matter of debate between Marxism–Leninism and other communist tendencies. To these tendencies, Marxism–Leninism is neither Marxism nor Leninism nor the union of both, but rather an artificial term created to justify Stalin's ideological distortion, forced into the CPSU and Comintern. In the Soviet Union, this struggle against Marxism–Leninism was represented by Trotskyism, which describes itself as a Marxist and Leninist tendency. Libertarian Marxism is a broad range of economic and political philosophies that emphasize the anti-authoritarian aspects of Marxism. Early currents of libertarian Marxism, known as left communism, emerged in opposition to Marxism–Leninism and its derivatives, such as Stalinism, Maoism and Trotskyism. 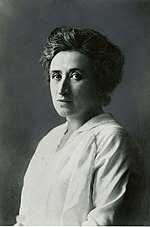 Libertarian Marxism is also critical of reformist positions, such as those held by social democrats. Libertarian Marxist currents often draw from Marx and Engels' later works, specifically the Grundrisse and The Civil War in France, emphasizing the Marxist belief in the ability of the working class to forge its own destiny without the need for a revolutionary party or state to mediate or aid its liberation. Along with anarchism, libertarian Marxism is one of the main currents of libertarian socialism. Libertarian Marxism includes such currents as Luxemburgism, council communism, left communism, Socialisme ou Barbarie, the Johnson-Forest tendency, world socialism, Lettrism/Situationism and operaismo/autonomism and New Left. Libertarian Marxism has often had a strong influence on both post-left and social anarchists. Notable theorists of libertarian Marxism have included Anton Pannekoek, Raya Dunayevskaya, CLR James, Antonio Negri, Cornelius Castoriadis, Maurice Brinton, Guy Debord, Daniel Guérin, Ernesto Screpanti and Raoul Vaneigem. Eurocommunism was a revisionist trend in the 1970s and 1980s within various Western European communist parties. They claimed to be developing a theory and practice of social transformation more relevant for Western Europe. During the Cold War, they sought to undermine the influence of the Soviet Union and the Communist Party of the Soviet Union. It was especially prominent in Italy, Spain and France. Left communism is the range of communist viewpoints held by the communist left, which criticizes the political ideas and practices espoused—particularly following the series of revolutions which brought the First World War to an end—by Bolsheviks and by social democrats. Left communists assert positions which they regard as more authentically Marxist and proletarian than the views of Marxism–Leninism espoused by the Communist International after its first congress (March 1919) and during its second congress (July–August 1920). Left communists represent a range of political movements distinct from Marxist–Leninists (whom they largely view as merely the left-wing of capital), from anarcho-communists (some of whom they consider internationalist socialists) as well as from various other revolutionary socialist tendencies (for example De Leonists, whom they tend to see as being internationalist socialists only in limited instances). Anarcho-communism differs from Marxism rejecting its view about the need for a state socialism phase before building communism. The main theorist of anarcho-communism, Peter Kropotkin, argued that a revolutionary society should "transform itself immediately into a communist society", that is should go immediately into what Marx had regarded as the "more advanced, completed, phase of communism". In this way, it tries to avoid the reappearance of "class divisions and the need for a state to oversee everything". 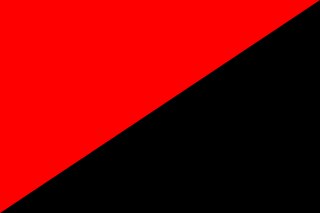 Some forms of anarcho-communism such as insurrectionary anarchism are egoist and strongly influenced by radical individualism, believing that anarchist communism does not require a communitarian nature at all. Most anarcho-communists view anarchist communism as a way of reconciling the opposition between the individual and society. Criticism of communism can be divided into two broad categories: that which concerns itself with the practical aspects of 20th century communist states and that which concerns itself with communist principles and theory. 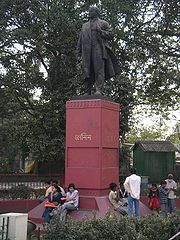 Marxism is also subject to general criticisms, criticisms related to historical materialism that it is a type of historical determinism, the necessary suppression of liberal democratic rights, issues with the implementation of communism and economic issues such as the distortion or absence of price signals. In addition, empirical and epistemological problems are frequently identified. ^ Principles of Communism, Frederick Engels, 1847, Section 18. "Finally, when all capital, all production, all exchange have been brought together in the hands of the nation, private property will disappear of its own accord, money will become superfluous, and production will so expand and man so change that society will be able to slough off whatever of its old economic habits may remain". ^ The ABC of Communism, Nikoli Bukharin, 1920, Section 20. ^ The ABC of Communism, Nikoli Bukharin, 1920, Section 21. ^ George Thomas Kurian, ed. (2011). "Withering Away of the State". The Encyclopedia of Political Science. CQ Press. doi:10.4135/9781608712434. ISBN 978-1-933116-44-0. Retrieved January 3, 2016. ^ Cassely, 2016 : Aix insolite et secrète JonGlez p. 192–193 (références Bibliothèque nationale de France). ^ Richard Pipes Communism: A History (2001) ISBN 978-0-8129-6864-4, pp. 3–5. ^ The Cambridge History of Iran Volume 3, "The Seleucid, Parthian and Sasanian Period". Archived from the original on June 11, 2008. Retrieved March 30, 2008. CS1 maint: BOT: original-url status unknown (link), edited by Ehsan Yarshater, Parts 1 and 2, p. 1019, Cambridge University Press (1983). ^ Lansford 2007, pp. 24–25. ^ "Diggers' Manifesto". Archived from the original on July 29, 2011. Retrieved July 19, 2011. ^ a b Bernstein 1895. ^ a b c "Communism". Encyclopædia Britannica. 2006. Encyclopædia Britannica Online. ^ Norman Davies. "Communism". The Oxford Companion to World War II. Ed. I. C. B. Dear and M. R. D. Foot. Oxford University Press, 2001. ^ Sedov, Lev (1980). The Red Book on the Moscow Trial: Documents. New York: New Park Publications. ISBN 0-86151-015-1. ^ Kushtetuta e Republikës Popullore Socialiste të Shqipërisë : [miratuar nga Kuvendi Popullor më 28. 12. 1976]. SearchWorks (SULAIR) (in Albanian). 8 Nëntori. 1977-01-04. Archived from the original on July 29, 2011. Retrieved June 3, 2011. ^ (in Russian) Declaration № 142-Н of the Soviet of the Republics of the Supreme Soviet of the Soviet Union, formally establishing the dissolution of the Soviet Union as a state and subject of international law. ^ "Gorbachev, Last Soviet Leader, Resigns; U.S. Recognizes Republics' Independence". New York Times. Retrieved April 27, 2015. ^ "Nepal's election The Maoists triumph Economist.com". Economist.com. April 17, 2008. Archived from the original on July 29, 2011. Retrieved October 18, 2009. ^ "Fighting Poverty: Findings and Lessons from China's Success". World Bank. Archived from the original on July 29, 2011. Retrieved August 10, 2006. ^ Engels, Friedrich. Socialism: Utopian and Scientific. Chapter 3. "But, the transformation—either into joint-stock companies and trusts, or into State-ownership—does not do away with the capitalistic nature of the productive forces. In the joint-stock companies and trusts, this is obvious. And the modern State, again, is only the organization that bourgeois society takes on in order to support the external conditions of the capitalist mode of production against the encroachments as well of the workers as of individual capitalists. The modern state, no matter what its form, is essentially a capitalist machine—the state of the capitalists, the ideal personification of the total national capital. The more it proceeds to the taking over of productive forces, the more does it actually become the national capitalist, the more citizens does it exploit. The workers remain wage-workers—proletarians. The capitalist relation is not done away with. It is, rather, brought to a head. But, brought to a head, it topples over. State-ownership of the productive forces is not the solution of the conflict, but concealed within it are the technical conditions that form the elements of that solution". ^ a b "State capitalism" in the Soviet Union, M.C. Howard and J.E. King. ^ "To the Rural Poor" (1903). Collected Works. vol. 6. p. 366. ^ Г. Лисичкин (G. Lisichkin), Мифы и реальность, Новый мир (Novy Mir), 1989, № 3, p. 59 (in Russian). ^ "Socialism: Utopian and Scientific". Friedrich Engels. Part III. Progress Publishers. "But, the transformation—either into joint-stock companies and trusts, or into State-ownership—does not do away with the capitalistic nature of the productive forces". ^ "Socialism: Utopian and Scientific". Friedrich Engels. Part III. Progress Publishers. "The proletariat seizes the public power, and by means of this transforms the socialized means of production, slipping from the hands of the bourgeoisie, into public property. By this act, the proletariat frees the means of production from the character of capital they have thus far borne, and gives their socialized character complete freedom to work itself out". ^ Pierce, Wayne.Libertarian Marxism's Relation to Anarchism. "The Utopian". 73–80. ^ The Retreat of Social Democracy ... Re-imposition of Work in Britain and the 'Social Europe'. Aufheben. Issue No. 8. 1999. ^ Hal Draper (1971). "The Principle of Self-Emancipation in Marx and Engels". Socialist Register. 8 (8). Retrieved April 25, 2015. ^ "A libertarian Marxist tendency map". libcom.org. Retrieved October 1, 2011. ^ Alan James Mayne (1999). From Politics Past to Politics Future: An Integrated Analysis of Current and Emergent Paradigms. Greenwood Publishing Group. p. 316. ISBN 978-0-275-96151-0. ^ Anarchism for Know-It-Alls. Filiquarian Publishing. 2008. ISBN 978-1-59986-218-7. ^ Fabbri, Luigi (13 October 2002). "Anarchism and Communism. Northeastern Anarchist No. 4. 1922". Archived from the original on 29 July 2011. ^ a b "What is Anarchist Communism?" by Wayne Price. Archived from the original on July 29, 2011. ^ Novatore, Renzo. Towards the creative Nothing. Archived from the original on July 29, 2011. ^ Bob Black. Nightmares of Reason. Archived from the original on July 29, 2011. ^ "Communism is the one which guarantees the greatest amount of individual liberty—provided that the idea that begets the community be Liberty, Anarchy ... Communism guarantees economic freedom better than any other form of association, because it can guarantee wellbeing, even luxury, in return for a few hours of work instead of a day's work". Kropotkin, Peter. "Communism and Anarchy". Archived from the original on July 29, 2011. ^ This other society will be libertarian communism, in which social solidarity and free individuality find their full expression, and in which these two ideas develop in perfect harmony. Dielo Truda (Workers' Cause). Organisational Platform of the Libertarian Communists. Archived from the original on July 29, 2011. ^ "I see the dichotomies made between individualism and communism, individual revolt and class struggle, the struggle against human exploitation and the exploitation of nature as false dichotomies and feel that those who accept them are impoverishing their own critique and struggle". "MY PERSPECTIVES – Willful Disobedience Vol. 2, No. 12". Archived from the original on July 29, 2011. Adami, Stefano. "Communism", in Encyclopedia of Italian Literary Studies, ed. Gaetana Marrone – P. Puppa, Routledge, New York, London, 2006. 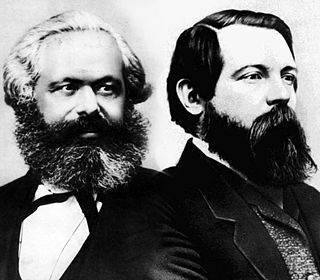 Marx, Karl and Friedrich Engels. Communist Manifesto. (Mass Market Paperback – Reprint), Signet Classics, 1998. ISBN 978-0-451-52710-3. Lindsay, Samuel McCune (1905). "Communism" . New International Encyclopedia. Self-identified communists hold a variety of views, including Marxism, Dengism, Trotskyism, Stalinism, council communism, Luxemburgism, anarcho-communism, Christian communism, Islamic socialism and various currents of left communism. The offshoots of the Leninism (Marxism–Leninism) are the most well-known of these and have been a driving force in international relations during most of the 20th century.